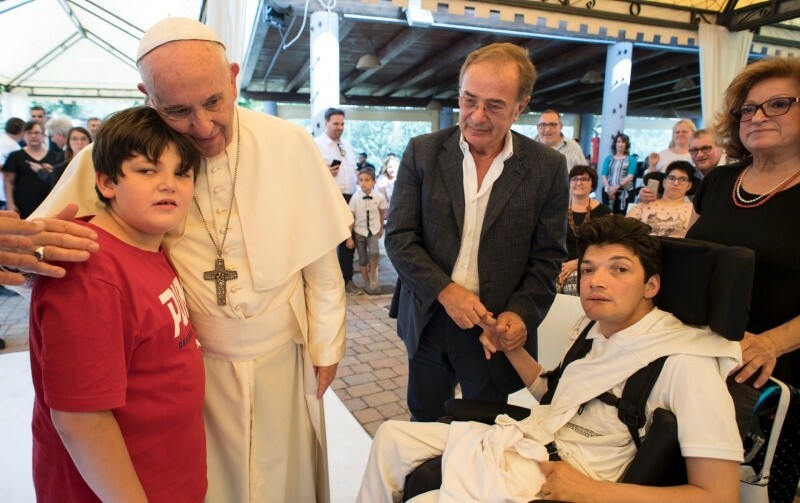 Pope Francis makes a surprise visit Sunday afternoon to “Casale 4.5” on the outskirts of Rome—bringing his word and his hugs to about 200 disabled persons. We are used to Pope Francis’ Mercy Friday visits. This time, he turned up on Sunday at a Cooperative called “Durante e dopo di Noi. Casa OSA” (During and after Us. Associated Health Care Workers House). Pope Francis shook hands and briefly spoke with each of the 200 people present. Luca Milanese, president of the group, explained to Pope Francis that “we have always taken to heart the happiness and well-being of those we assist—numbering about 50,000 in all of Italy today”. He continued to explain that the goal is that each person served will be able to improve their life, moving toward autonomy, with the help of their loved ones and health care workers. “ ‘Casa OSA’ is a project of life that stimulates the emotions, attitudes, relationships and the desires of those assisted and which sustains the families whose only desire is that of guaranteeing a dignified future to their children even beyond when they are no longer present”, Mr Milanese said. Pope Francis said he was grateful for a “family day”, and encouraged those present saying “believe in dreams and in the beauty of life in union with the Lord”. Who is the “Dopo di Noi” foundation? The facility Pope Francis visited is part of a chain working with people with grave disabilities and their families to project long-term possibilities and assistance for disabled persons. The non-profit "Dopo di Noi" foundation was founded in 1984 to assist people with disabilities to develop a long-term plan in view of the future when family members can no longer provide care. It is part of a larger organization called Anffas which has dedicated itself for 60 years advocating for the rights of disabled persons.